Sorry Charlie, you have dropped to number two: For the month of March Stan Aoki moved up to number one! We appreciate the work Stan is doing for KCIF as director of the Jesus Hour and Chairman of the Program Committee along with the many other things he does freely! Thank you Stan!! 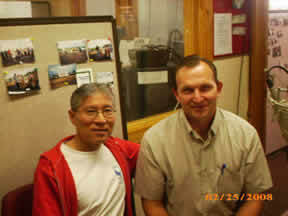 This picture of Stan was taken with Pastor Vasili of the Seventh Day Adventist church in Hilo! Charlie on the left. Pastor Rob Daley on the right. Pastor Rob is our President. Charlie Davis does about everything. Besides being our night watchmen he also runs the board, enter programs, keeps the station on air, gets the mail, reboots the computers, and just about everything else. This picture of Charley includes Emily Souza and Susan Daley Emily is another one of our faithful volunteers. She answers the phone and always has a friendly greeting to everyone who visits the station when she is on duty. Susan Daley is the wife of our president and helps KCIF each year with our annual sharathons. At the right is a picture of Frances Wong who has organization skills and keeps the station organized. Also as part of her leadership skills she plans and runs our annual sharathons. And then there is Pearl Awaa who runs the board for the Jesus Hour. What a blessing! She works in production along with doing other important tasks.